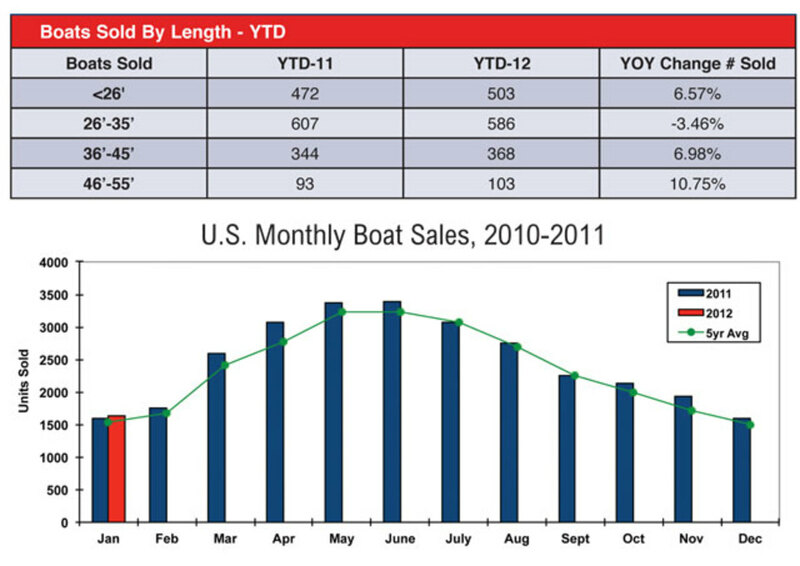 Sales improved in January for U.S. yacht brokerages, compared with the same month in 2011. The number of boats sold increased by 4 percent, to 1,628, and the total value of those boats rose by 9 percent, to $193 million. A year earlier, 1,571 boats were sold for an aggregate of $178 million. All of the figures here reflect reports from YachtWorld.com member brokers to their proprietary database, SoldBoats.com. Boat sales increased in four of five size ranges, with the largest unit gain coming in the smallest size — 503 boats under 26 feet, a pickup of 31 boats. The largest percentage increase was among the biggest boats — 13 additional boats over 55 feet were sold, a gain of 24 percent. Increases of 7 and 10.75 percent were reported in the 36-to-45-foot and 46-to-55-foot categories, respectively. Only among boats from 26 to 35 feet was there a decline — 3.5 percent, with 586 boats sold. Changes in total sales value by category were mixed. The value of boats over 55 feet that sold increased by $17 million, to $78 million, a 27 percent gain. Rising 6 percent in value from January 2011, with $48 million in sales, were boats between 36 and 45 feet. However, boats 46 to 55 feet sold for 12 percent less than a year earlier, with $25 million in total value, and sales of all boats 35 feet and under brought incrementally lower valuation, with sales of $43 million, down from $44 million. Countering a downward 2011 trend, brokers who closed deals involving sailboats in January reported a 9 percent increase, with 335 boats sold, and a 21 percent valuation gain, with $28 million in sales. Sales of powerboats rose 2 percent for the month, with 1,294 sold, and the value of powerboat sales climbed 7 percent, with $168 million in sales. Brokerage sailboats and powerboats sold a little faster in January, on average, continuing a general trend during the last year. From mid-2009 to mid-2011, it typically took nine to 10 months or more to sell a boat. But starting in July 2011 the average time to sale has fallen below 270 days. This January, the average was 268 days, down from 275 in January 2011. Month to month, we track the five-year average in brokerage boat sales, and in 2012 we’re no longer including any of the banner years in sales between 2005 and 2007, when January sales often exceeded 2,000 boats and total annual sales were in the 33,000- to 34,000-boat range. Starting in 2008, annual sales have been 10 to 20 percent lower, totaling 27,000 to 30,000 boats.